In a manner of speaking, John Ulin came out of “retirement” for a good cause. The 51-year-old Ulin, a copyright and trademark lawyer by day, has been seen training for a marathon since September and was most recently spotted running the 17 miles from San Marino to Irwindale for the 626 Golden Streets event on March 5. John Ulin trains for the Boston Marathon. “I’m too old to be training for this one,” Ulin quipped in a telephone interview. Ulin is training for this year’s Boston Marathon, which is slated for April 17, at the behest of daughter Christine, who will graduate from Emerson College in May with a degree in communication disorders. Ulin is making good use of the dare. 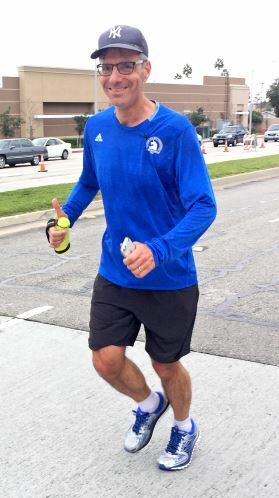 He was selected to be sponsored by Special Olympics and is quite close to his fundraising goal of $26,200 for the organization (essentially, $1,000 for each of the 26.2 miles in a marathon). For what it’s worth, Ulin said this has been a worthwhile experience. He pointed out how well it works out that his daughter is studying communication disorders and he is fundraising for Special Olympics. He commended Metro for its Golden Streets event that helped him train, and he hopes it will return next year. The next question was obvious. Will Ulin, who moved to San Marino with his family in 1999, hang up his shoes after April 17? As of Tuesday, Ulin had raised $22,626 for Special Olympics. To contribute through April 17, visit crowdrise.com/SpecialOlympicsMassBoston2017/fundraiser/johnulin.